This was our month for Rioja; first the more traditional red and now the less available white. Wait, you didn’t know there was a white Rioja? It’s ok, I don’t think many people are aware of it. That’s why we chose to include it on WineAndCheeseFriday. It is a new wine for us, too. We only recently found out about it, so we couldn’t pass it up when we saw it in the store. The cheese is coincidentally from Spain as well. Here we are with another Spanish Wine and Cheese Pairing. Let’s see how this one goes! Since we’ve never tasted a white Rioja wine, we didn’t know the grapes used for the wine or any specific flavors or aromas to look for. This made it more of an adventure when creating our notes! As I swirled the wine, I initially thought apple, then lime but decided on green apple aromas. There were also light honey and possibly oak aromas too. We did find it a bit hard to pin down the aromas. Neil thought it smelled more acidic but also a little floral, reminding him of the aromas of a Sauvignon Blanc. Once we took a sip of the Rioja, we noticed an acidic flavor. It seemed like green apple to me with some mineral notes and I could feel the wine on my teeth and tongue. Neil found that although it was a little bit tart, there was some oak too. He described it as light and fresh and a pretty good wine. This wine is dry, makes my mouth water and had a lingering finish. We love trying new wines! Let’s find out a little more about white Riojas from Wine Folly. First off, the main grape that is used is called Viura, as it’s known in Rioja, but it’s the same grape as Macabeo. Have you heard of either of these? 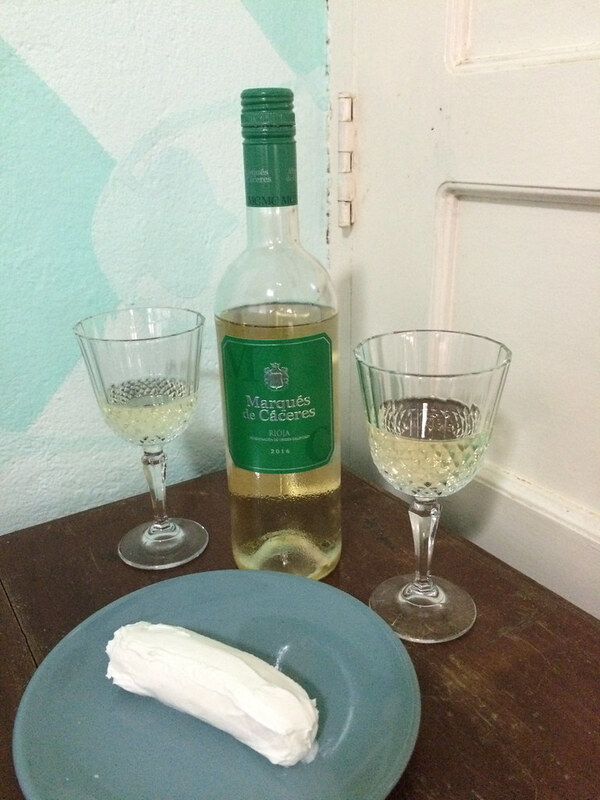 The white Riojas can either be “fresh” or aged, and we tried a fresh one this time. As you can imagine, both styles produce different tasting notes. I wonder how we did at identifying them? Looks like the only one we didn’t touch on was salinity. WTG us! Seems like the one we chose was pretty representative of the varietal and not bad at only $12. This week’s cheese is called a goat cheese log by the manufacturer, El Pastor, but it seemed like chèvre to us. Maybe chèvre is reserved for logs of goat cheese made in France? Come to find out, chèvre describes any French goat cheese no matter what the consistency is and this cheese is more accurately a fresh goat cheese since it’s not aged. Ah-ha. Now that we have that covered, we should probably taste it. We began by establishing that this cheese certainly smells like fresh goats’ milk and some salt! If it were a blind tasting, I would have known it was fresh goat cheese. There were some tangy aromas, too. Neil also picked up something that made him think of cheddar cheese. He wondered if it could have been the preservatives. The texture was smooth, creamy, and light. Neil noticed flavors of super fresh goats’ milk, a natural funk and a little bit of salt. I think I found the salt we missed in the wine, because it was a very salty cheese to me and it kind of made my mouth water. When Neil described this cheese, he said it was a super fresh goat cheese that was very milky. I don’t think either of us noticed anything different than a fresh French cheese? During the pairing of white Rioja and our goat cheese log, the wine was pretty tart but cleansed my tongue. The flavor of the Rioja seemed to change into something that reminded me of a dry Riesling with a hint of effervescence. The cheese seemed more funky but more interesting. The texture of the cheese seemed thicker too and coated my tongue more. Neil found the cheese to become sweet like a lychee and the wine was more yeasty like a beer. He only noticed a brief change and then the original flavors returned. It seems this pair really interacted with my mouth, and it was an interesting one. I’d prefer the wine more in the pairing than by itself. And now we can say we’ve tried a white Rioja! Previous Post: Rioja with Sheep Cheese, A Little Piece of Spain! Next Post: Wine And Cheese Friday Celebrates 5 Years!